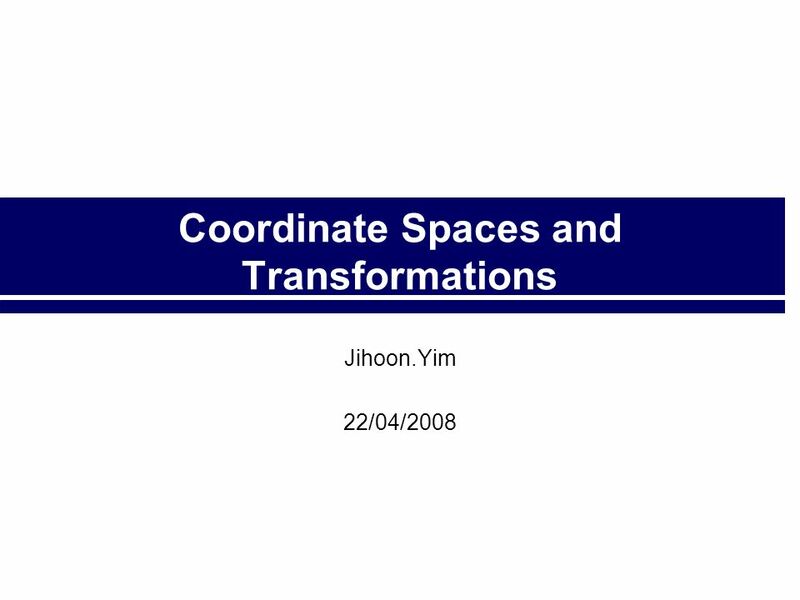 Coordinate Spaces and Transformations Jihoon.Yim 22/04/2008. 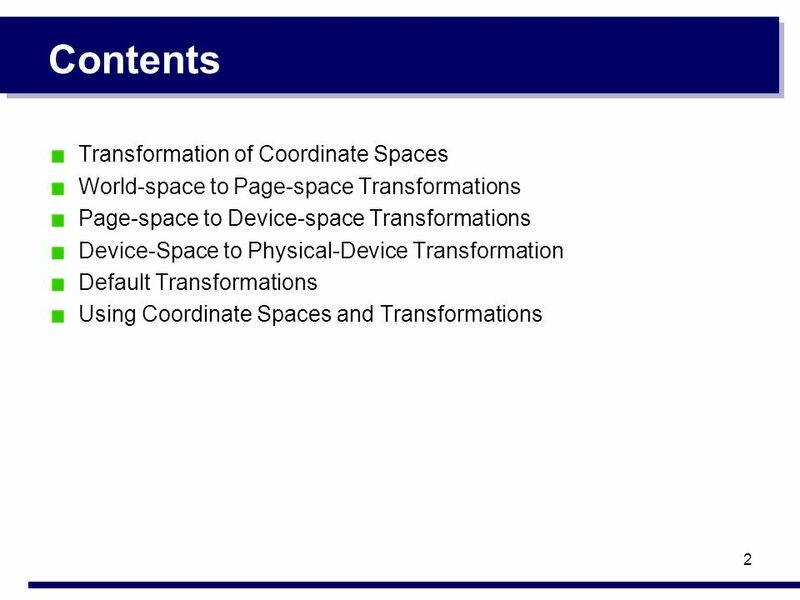 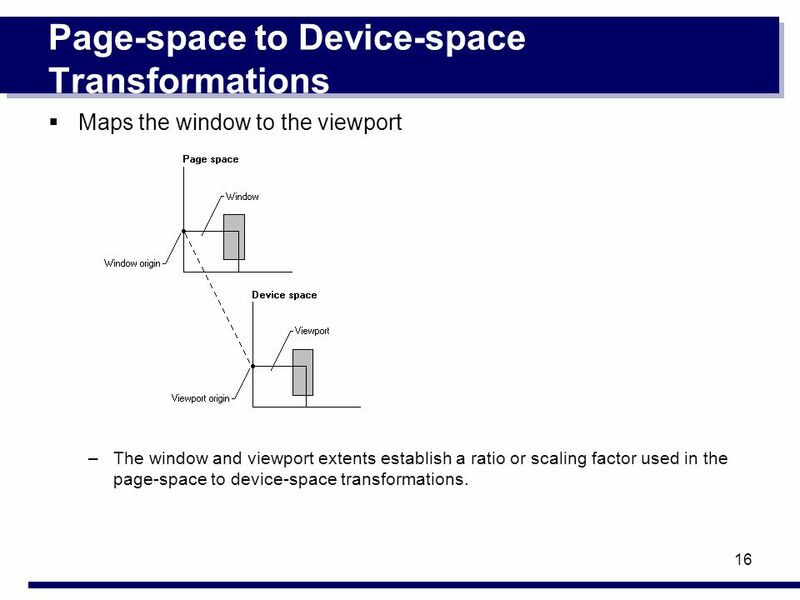 16 16 Page-space to Device-space Transformations Maps the window to the viewport –The window and viewport extents establish a ratio or scaling factor used in the page-space to device-space transformations. 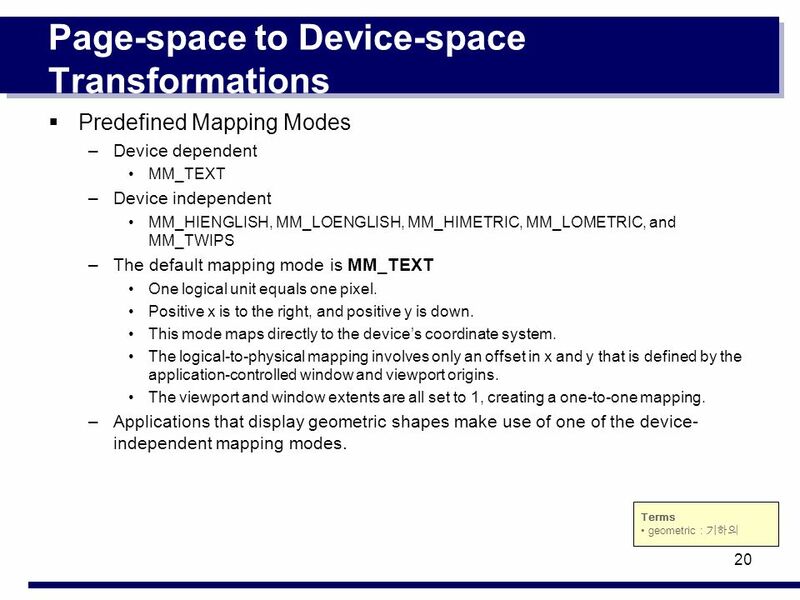 17 17 Page-space to Device-space Transformations Maps the window to the viewport Predefined mapping modes –MM_HIENGLISH, MM_LOENGLISH, MM_HIMETRIC, MM_LOMETRIC, MM_TEXT, and MM_TWIPS –the extents are set by the system when SetMapMode is called. 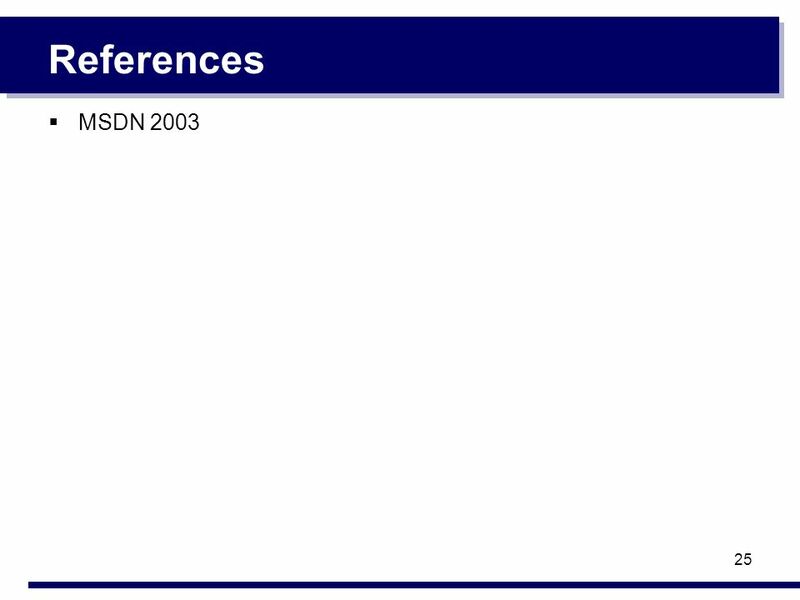 –They cannot be changed. 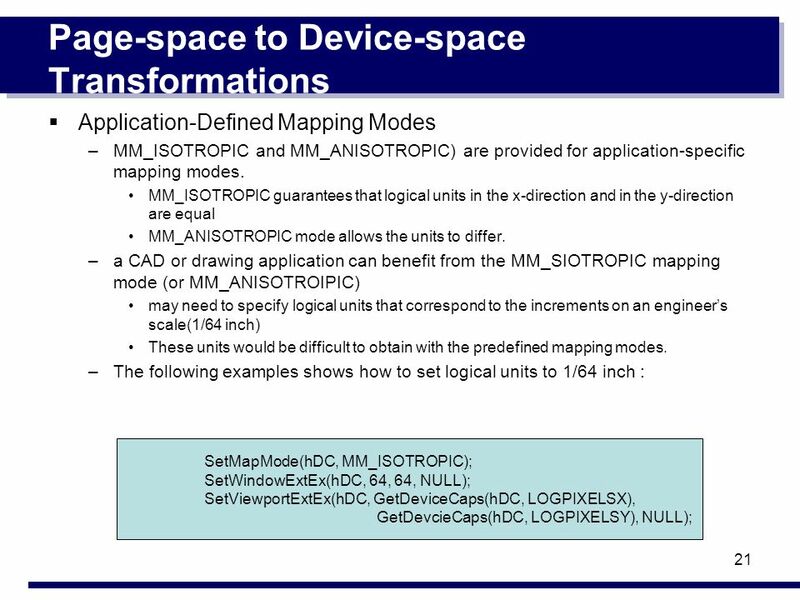 The other two mapping modes –MM_ISOTROPIC, MM_ANISOTROPIC –the extents must be specified. 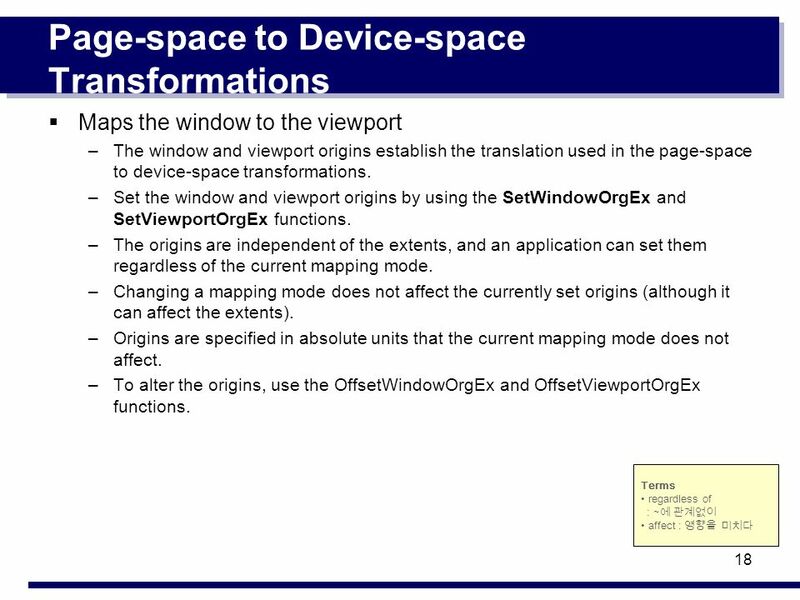 –After calling SetMapMode, call the SetWindowExtEx and SetViewportExtEx functions to specify the extents. 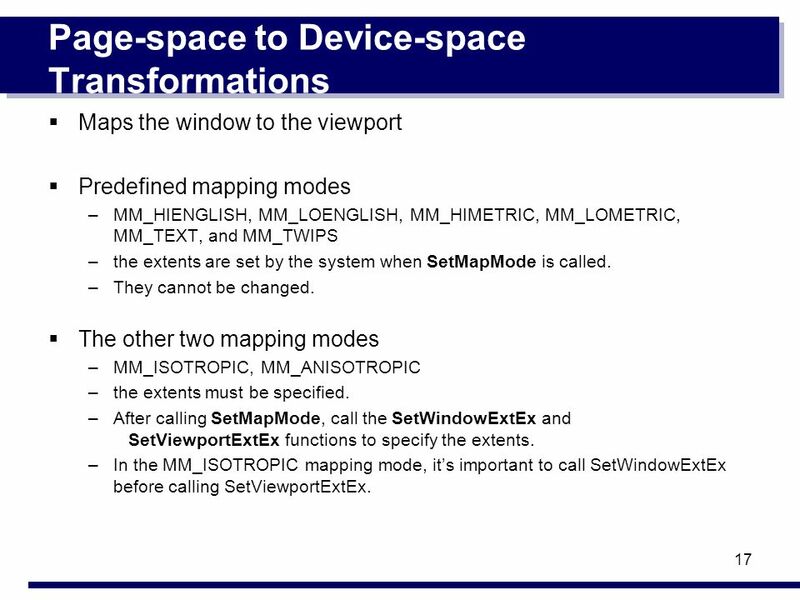 –In the MM_ISOTROPIC mapping mode, its important to call SetWindowExtEx before calling SetViewportExtEx. 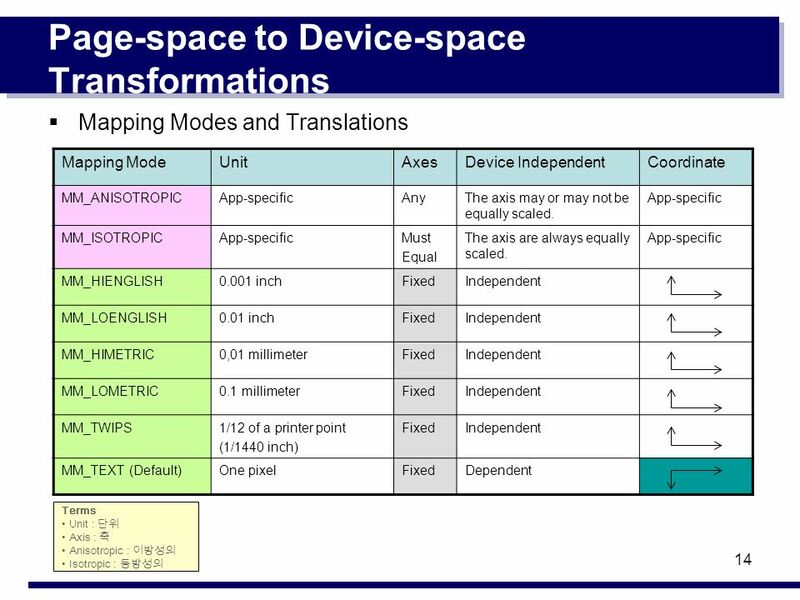 22 22 Device-Space to Physical-Device Transformation Unique in several respects –It is limited to translation and is controlled by the system. 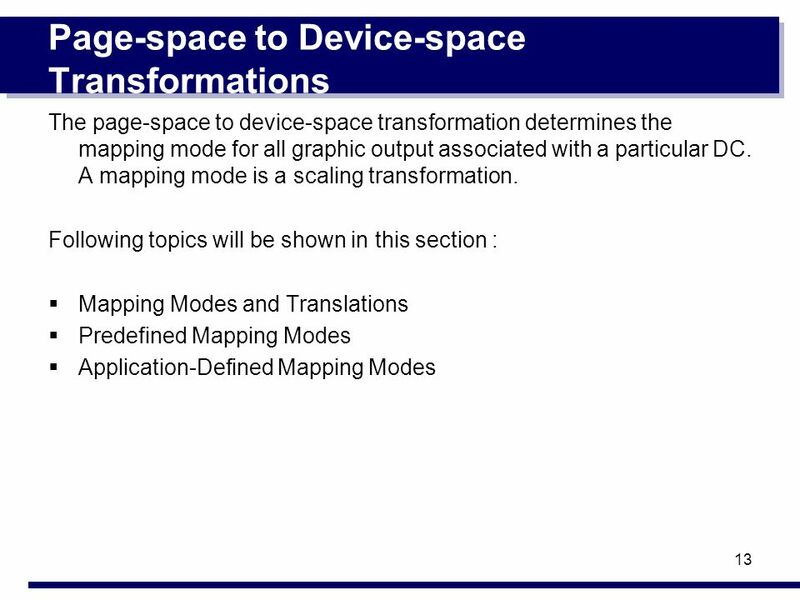 –The sole purpose of this transformation is to ensure that the origin of device space is mapped to the proper point on the physical device. 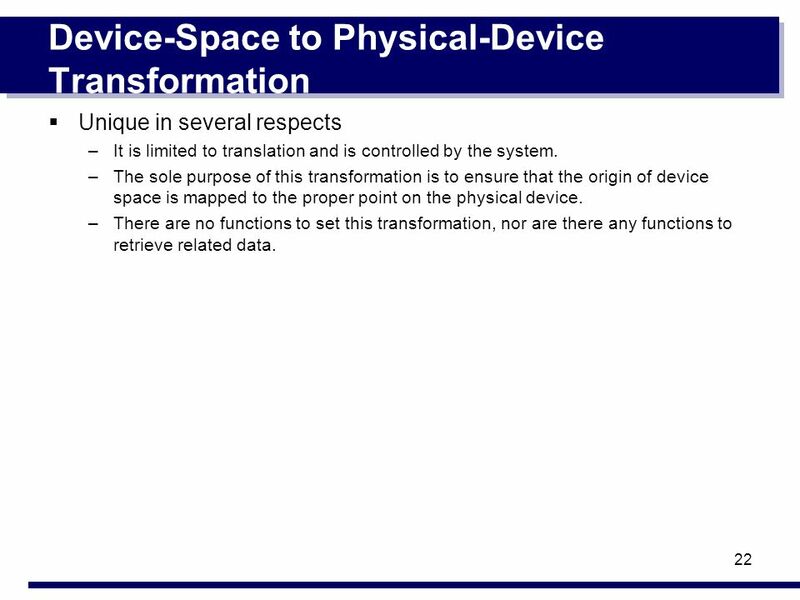 –There are no functions to set this transformation, nor are there any functions to retrieve related data. 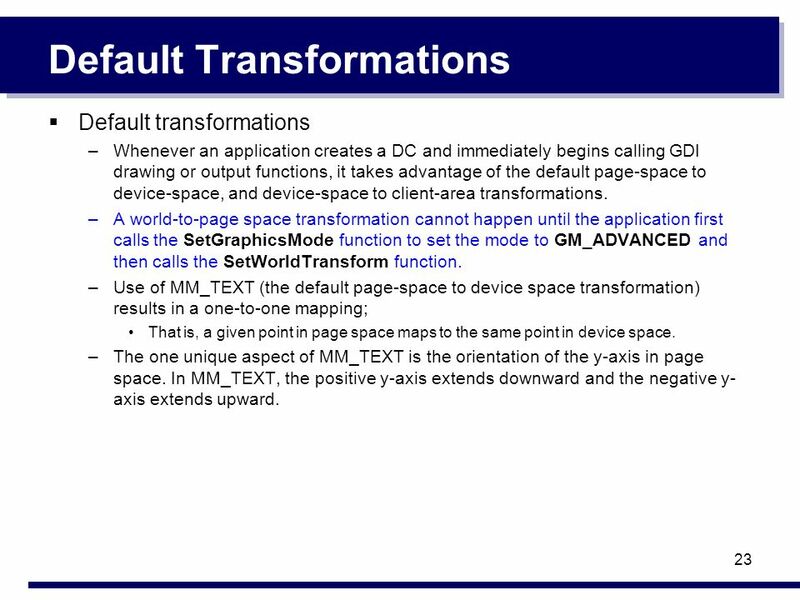 23 23 Default Transformations Default transformations –Whenever an application creates a DC and immediately begins calling GDI drawing or output functions, it takes advantage of the default page-space to device-space, and device-space to client-area transformations. 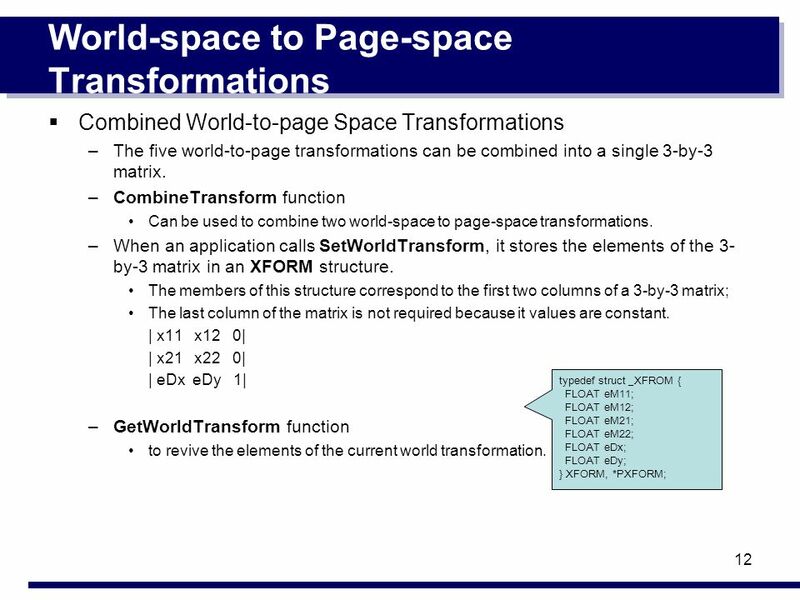 –A world-to-page space transformation cannot happen until the application first calls the SetGraphicsMode function to set the mode to GM_ADVANCED and then calls the SetWorldTransform function. 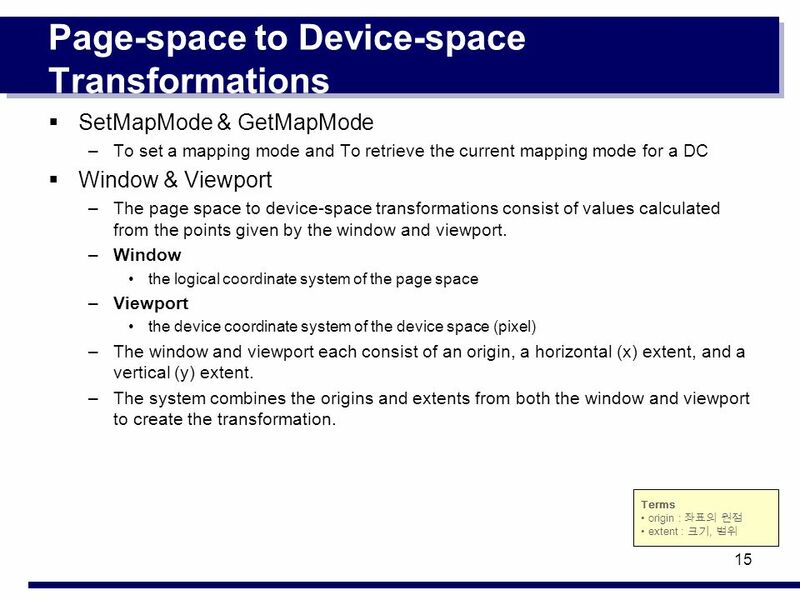 –Use of MM_TEXT (the default page-space to device space transformation) results in a one-to-one mapping; That is, a given point in page space maps to the same point in device space. 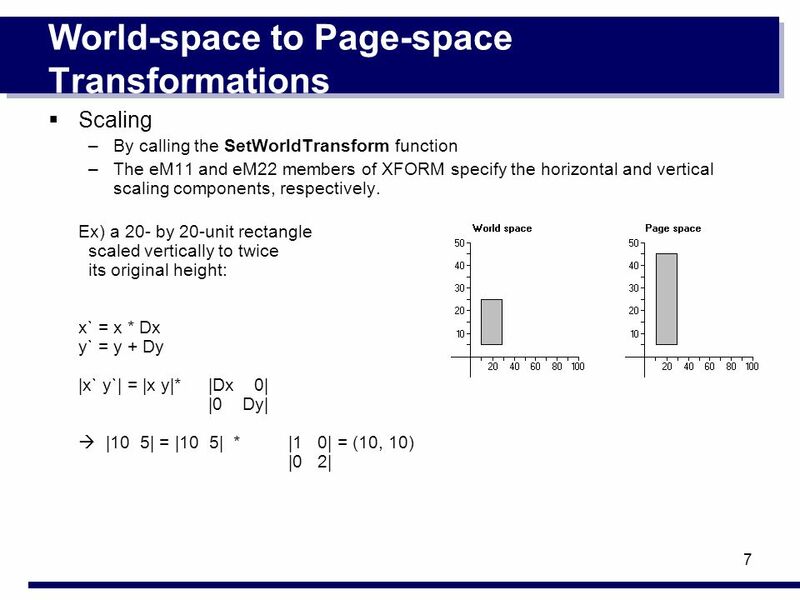 –The one unique aspect of MM_TEXT is the orientation of the y-axis in page space. 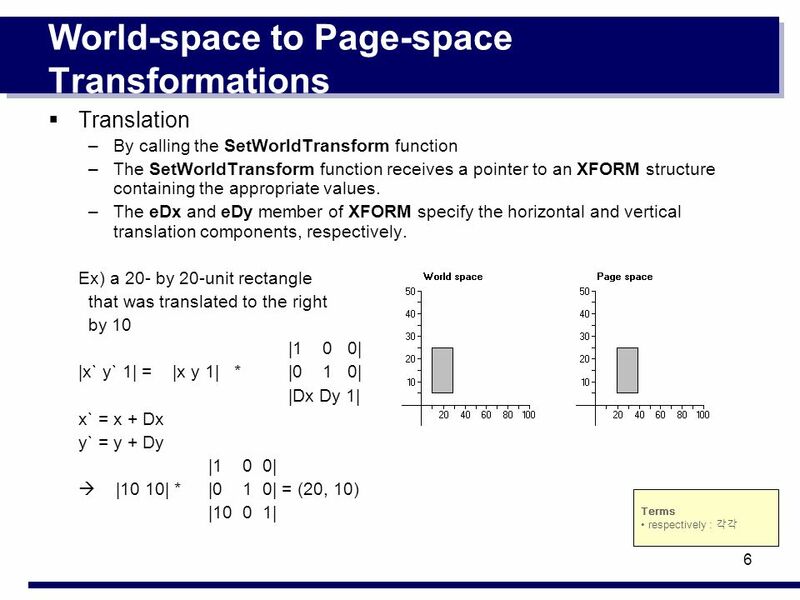 In MM_TEXT, the positive y-axis extends downward and the negative y- axis extends upward. 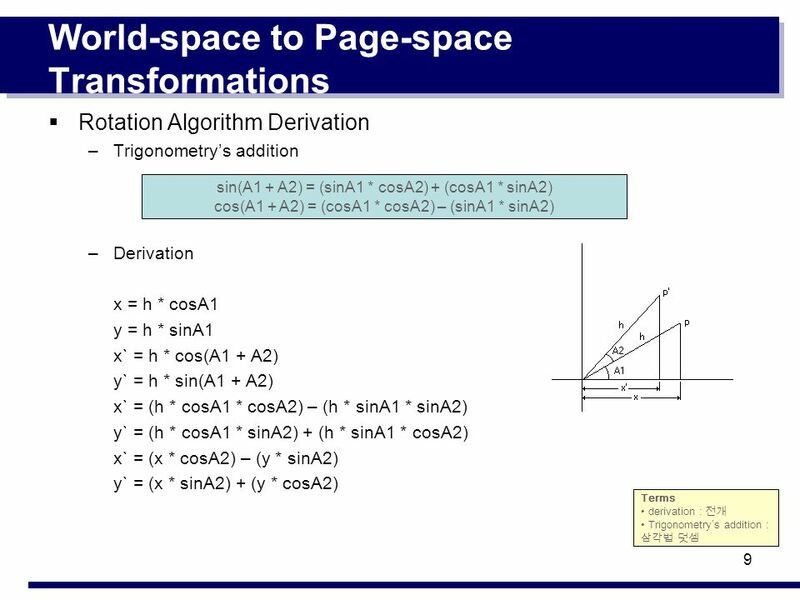 24 24 Using Coordinate Spaces and Transformations The example contains the following tasks: –Drawing graphics with predefined units. 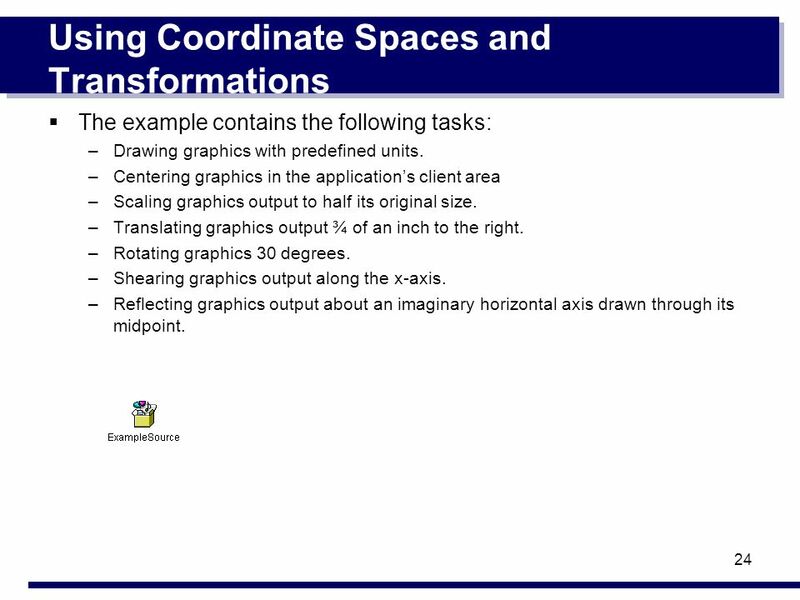 –Centering graphics in the applications client area –Scaling graphics output to half its original size. 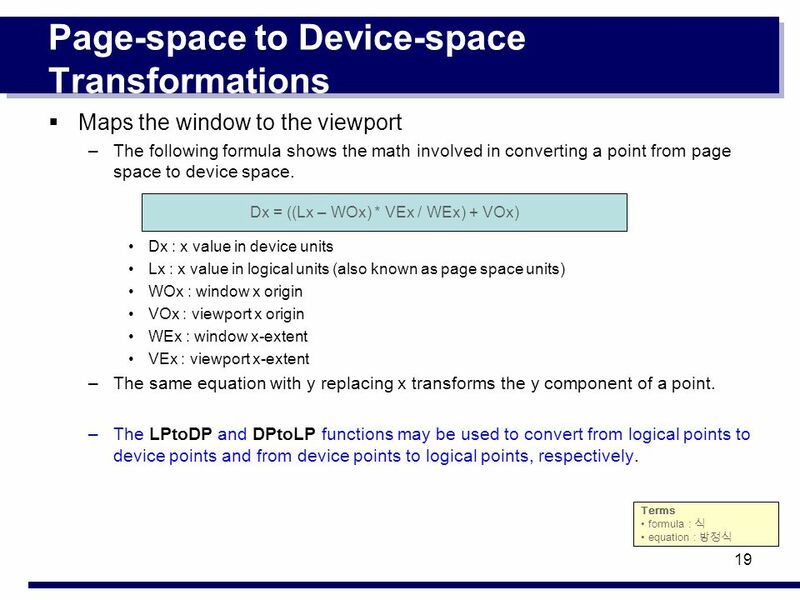 –Translating graphics output ¾ of an inch to the right. 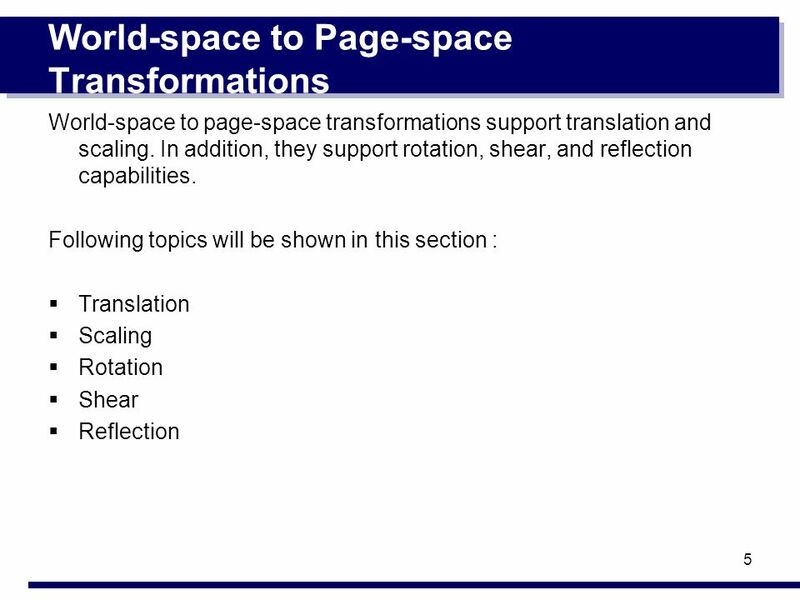 –Rotating graphics 30 degrees. –Shearing graphics output along the x-axis. 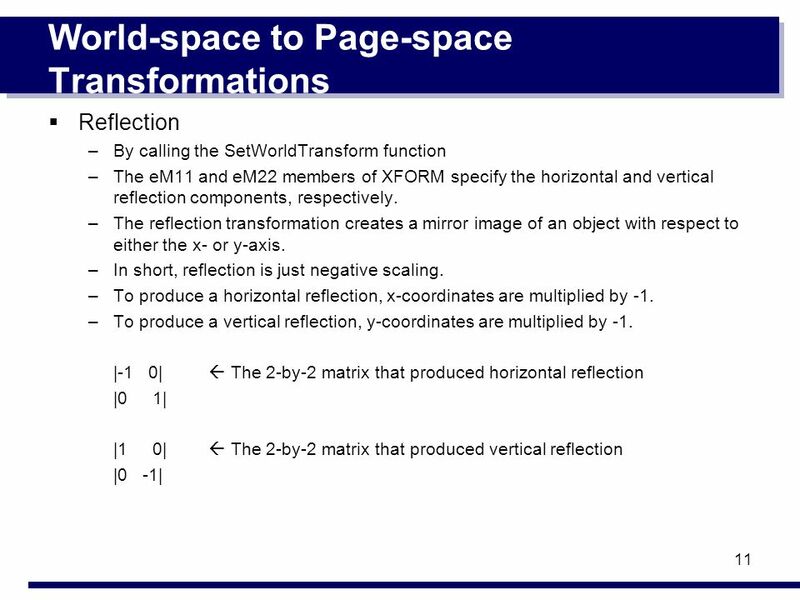 –Reflecting graphics output about an imaginary horizontal axis drawn through its midpoint. 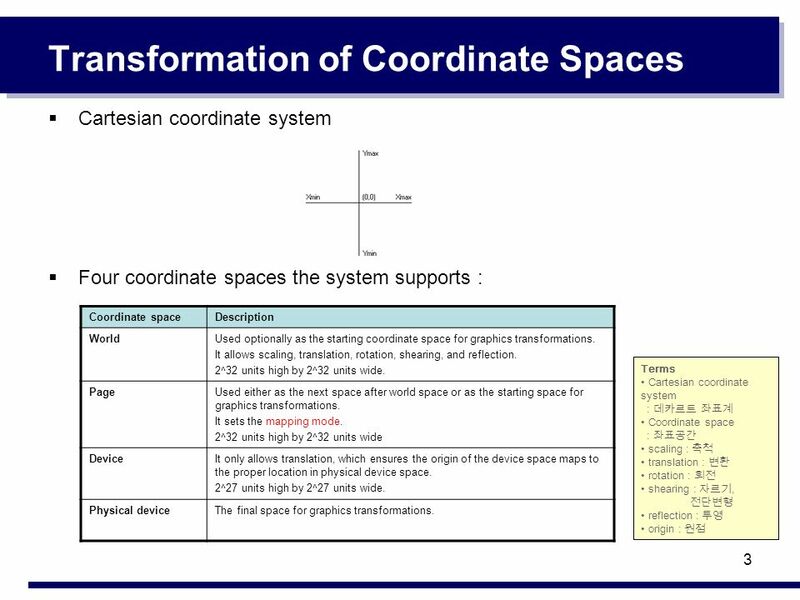 Download ppt "Coordinate Spaces and Transformations Jihoon.Yim 22/04/2008." 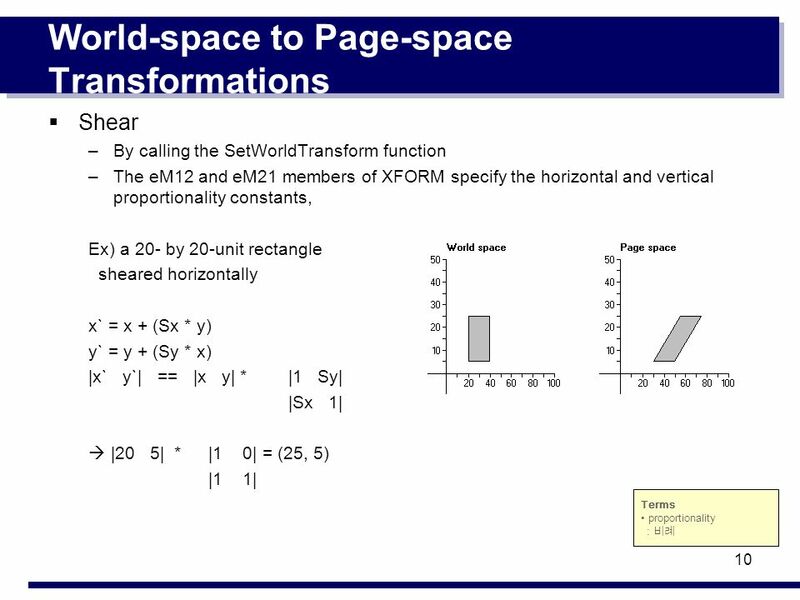 7.1 Si23_03 SI23 Introduction to Computer Graphics Lecture 7 Introducing SVG Transformations on Elements. 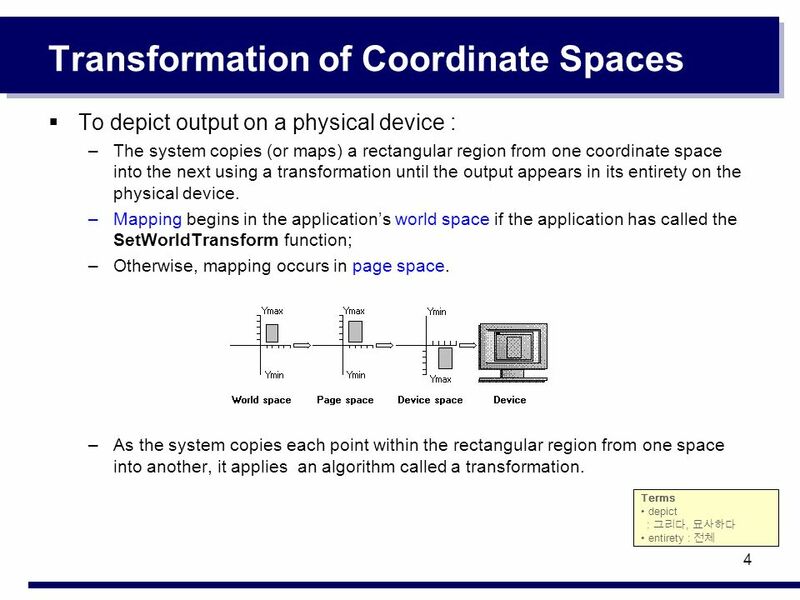 1GR2-00 GR2 Advanced Computer Graphics AGR Lecture 9 Adding Realism Through Texture.